My grandfather could not fly, or leap over tall buildings with a single bound, but I would not be surprised if one day I heard a story told that he accomplished those feats and more. Watson Burdalski was a legend in the Polish Whitman Park section of Camden, New Jersey, in the 1950’s. I heard that Dziadzia once swam across the treacherous Delaware River to Philadelphia. He was an acrobat who could pop his joints in and out at will. He was an enforcer not only for the mob, but also for a small Polish National Church congregation that was being bullied by loan sharks. Dziadzia did not belong to the church, but, like Superman, he came to the aid of anyone in the neighborhood that had need of his tough guy exterior and strong arm. The priest who told me the story assured me that there were many more stories like his. Some of the legends have a sour note. Watsie, as he was known in the Polish section of Camden, spoke his mind, freely and loudly. He berated customers who came to his grocery shop with a competitor’s bag in hand. He yelled at people–or so I have heard. I don’t remember any yelling. In my mind, any loud or harsh words I may have heard him utter were well-deserved by the recipient. I idolized him and felt protected by him, as though I had someone on my side who was afraid of nothing. One warm October evening in 1960, I presented him with my first report card. After closing his produce store, Dziadzia took me on a celebratory tour of the other shops along Mt. Ephraim Avenue, introducing his genius–his first grandchild, of course she is a genius! — granddaughter to his fellow merchants. The first stop was Rossner’s Shoe Store next door. Heads nodding solemnly, Mr. and Mrs. Rossner approved of my grades. Next, we walked across the street to the dress shop. As I tried on a frilly red dress in the makeshift dressing room in the storage area, I heard Dziadzia bragging about my straight “A’s.” I poked my head out of the curtain and called to him. He cut me off with a wave of his hand and turned back to speculating with his fellow merchant about my future as a doctor or president. I emerged in a fluff of crinkly red tiers and was ordered to parade up and down the narrow store aisle. After the dress was modeled and packaged, Dziadzia and I capped off the celebration with a chocolate ice cream soda at Chris’s Sweet Shop. We formed a mini-parade that evening–Dziadzia strutting along Mt. Ephraim Avenue, his chest puffed out like a proud peacock, cigar clenched in his teeth, Stetson hat on his head, and little Debbie hopping alongside, solemnly attempting to match his stride. Perhaps, I should stop here and mention that Watson Burdalski had lost a leg to diabetes. He took those strides wearing a heavy, wooden, artificial leg. The prothesis was anchored with bulky leather straps. Having no right leg did not stop Dziadzia from driving, even though handicapped-equipped cars were yet to be invented. He rigged his standard shift ’50’s Chevy with a broomstick and wooden block and somehow worked all three pedals with that contraption and his left leg. One August day, he arrived to pick me up for an outing, and my mother told me to get in the back seat. She was nervous for my safety in the front seat. But Dziadzia waved a hand at her worries. “Get in the front,” he ordered me. I looked at him, then at my mother, who shook her head no and mouthed the words “back seat,” then back at him. I got in the front. After we turned the corner and escaped my mother’s eyes, he handed me the broomstick and taught me how to push the gas pedal while he worked the shift and brake pedals. From Dziadzia I learned never to be frightened of scars or loss. He taught me to keep moving, no matter what life tries to take away. 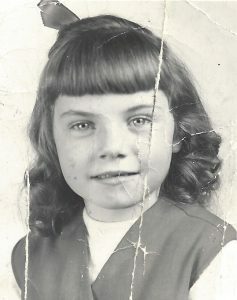 From him, I learned to treasure the “A’s” of life and celebrate them, even if life’s report card contains lower grades. Sometimes I catch a whiff of a cigar, and I laugh at the memory of our fearless parade. NOTE: “Linda” is a composite of my friends. In 1954, the most common names for baby girls were Mary, Linda, and Deborah. As my father pulled the car, full of giggling seventh-grade girls, alongside the Collingswood Junior High School gym on that cool September evening in 1966, I could hear the Supremes’ new hit, “You Can’t Hurry Love” ringing out of the old, red brick building. I could feel the bass notes thumping through the car. As the students opened the doors to enter, the music became loud, then muffled again, as if I put my hands on and off over my ears. In my mind’s eye, the bricks themselves vibrated with the beat. My parents had debated about allowing me to attend the dance. I was now in the seventh grade, and my mother had ideas about my growing up too fast. I already knew the ground rules of my teenage years: no dating until I was sixteen, no drive-in movie theaters with boys, no hanging out in front of Mom’s Pizza Shop on Haddon Avenue. I could attend school dances, but only once a month. The other Saturday nights, I had to visit my Babcia in Camden. Babcia loved to watch The Lawrence Welk Show with me. So, three Saturdays a month, I listened to big band music; the fourth, Motown. The pulsating gymnasium both beckoned and frightened me. What could it contain, I thought, that made my mother fearful? How would dancing transform me into one of those teens my mother was always talking about–the ones she called “fast” or “hard?” Boys were involved, I knew, and there were boys at the dance. There were chaperones at the dance too, parents and teachers, but it was a public school, who knows what they overlooked that the priests and nuns would not have tolerated at my former parochial school, Saint John’s. As I crossed the threshold of the gym with my girlfriends, I was petrified. What would I do if a boy asked me to dance? Would my mother find out? I was still young enough to suspect that she had mind-reading powers. Linda had already jumped out of the car and was talking to a boy on the gym steps. My mother frowned. I hopped out of the car and slammed the door before she could decide to take me back home. The door to the gym opened. My coming-of-age ceremony had begun. My first step inside would cross the dividing line between my new teenaged world and that of my parents. The music hit my ears. I could feel the beat in my bones. The gym was so dark I could hardly make out the faces. In the middle, classmates, mostly girls, bounced and gyrated. Other shapes, mostly boys holding bottles of Coke, lined the walls. To get to the locker room (where we combed our hair and applied way more makeup than was allowed at home), my friends and I had to walk the gauntlet of eighth and ninth graders. Faces peered out at us in the dark. I felt claustrophobic and free at the same time. I tried to focus on following Linda, who sashayed confidently through the dancers, causing a ripple of heads along the wall to turn as we passed. More than anything, I wanted to be Linda at that moment, but following in the wake of that reflected attention was sweet enough for that night. As the night went on, the claustrophobia was replaced with exhilaration. In the darkness, drenched with the music of my generation, I danced with my peers, my tribe, away from my living room, away from my mother’s approbation. I danced over the generational divide and finally understood why my mother feared this rite of passage.